Oregon State University is collaborating with industry on a major breakthrough that could increase the value of Oregon timber, stimulate manufacturing, create jobs and drive economic growth in rural communities. It’s called cross-laminated timber, and it may catapult Oregon wood products to the forefront of construction innovation and technology. College of Forestry associate professor Lech Muszyński is leading a research and development partnership with DR Johnson and Riddle Laminators in Douglas County on design and production processes for Oregon-made cross-laminated timber panels. The research has received funding for commercialization from Oregon BEST. Cross-laminated timbers can replace steel or concrete in high-rise construction and are already gaining acceptance in Austria, Norway, Canada and New Zealand. Made by bonding together perpendicular layers of dimensional lumber, cross-laminated timber panels can be more than a foot thick and 80 feet long. The benefits are many. Cross-laminated timbers can dramatically reduce construction time and costs. They’re environmentally friendly, made from a renewable resource that also sequesters carbon. And buildings constructed with cross-laminated timber may be more earthquake resilient. Valerie Johnson, president of DR Johnson, says cross-laminated timbers “meet or beat” traditional construction materials in every aspect. Oregon BEST funded the project in part because of the potential for job creation. Oregon could become the next hub for cross-laminated timber development and manufacturing due to its rich and diverse timberlands, which rank among the most productive in the world. 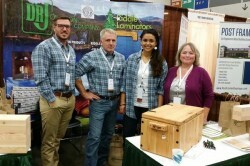 The combination of high-quality raw materials and value-added manufacturing could revitalize small towns in Oregon’s timber country, creating jobs for sawmill workers and laminators, as well as new business for contractors, suppliers of specialized fittings and connectors and specialized equipment manufacturers.